UK CPI Inflation smashed through the 5% barrier by rising to 5.2% for September (4.5%), which is now approaching near triple the Bank of England's 2% target that continues to make a mockery of the central bank whose primary remit is supposedly price stability, where 3% was supposed to have been the maximum level a break above which was supposedly to trigger a series of panic measures to bring inflation under control, instead of which the Bank of England has instead opted to print money as it recently announced another £75 billion of electronic money printing that the fractional reserve banking system would eventually leverage to over £1 trillion, for the primary objective for the monetization of government debt, i.e. the same policy that the Weimar republic had been engaged in on its path towards hyperinflation. 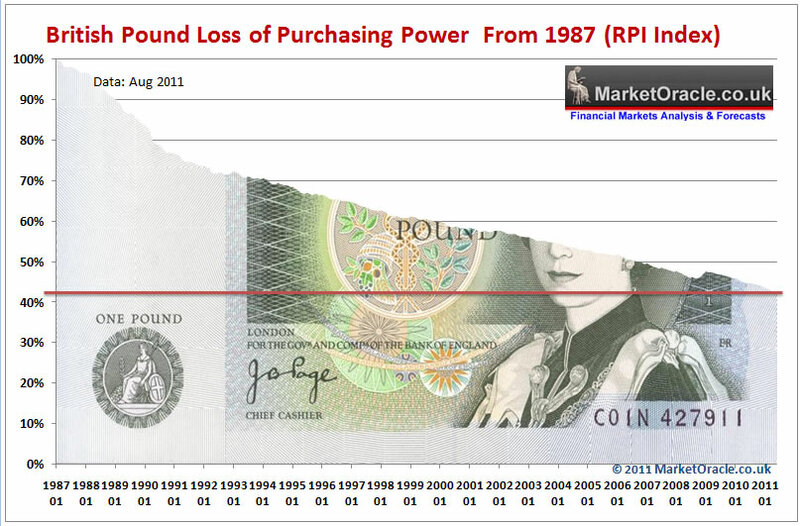 UK public debt is probably being monetized at the rate of 15% per annum with approx 30% monetized to date, only the deflation fools and the vested interest academic economists cannot or choose not to realise the highly inflationary consequences of governments monetizing their debt. Meanwhile the more recognised RPI Inflation measure surged higher to a 20 year high of 5.6% which is set against average pay rises of just 2% that illustrates an Inflationary Depression in progress. UK inflation has soared to above my already high expectations as per the January forecast for 2011 (17 Jan 2011 - UK Inflation Forecast 2011, Imminent Spike to Above CPI 4%, RPI 6% ) that expected Inflation to remain above Bank of England's 3% upper limit for the whole of 2011, which is set against the Bank of England's Feb 2011 Inflation Report that expected CPI of just 1.7% by the end of 2011. However, actual inflation as experienced by most people in Britain currently stands at an even hideously higher rate of 7.36%, which explains why your weekly groceries bill is inflating at a rate twice the official inflation indices that have been manipulated by successive governments to under-report the true rate of inflation. 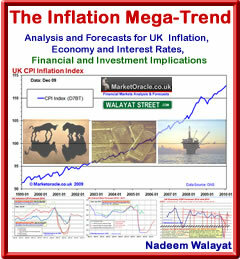 The latest inflation of CPI 5.2% is set against an stuttering economy where expected growth of just 1% for 2011 continues to confirm that Britain remains in an Inflationary Depression as covered at length in my weekend analysis (15 Oct 2011 - Bank of England's Quantitative Inflation Bankster's Paradise Inflationary Depression Economy ). Contrary to the Bank of England's economic propaganda of high inflation always being just temporary (for 2 years now), there is nothing surprising about persistently high inflation as I warned of now approaching 2 years ago in the Inflation Mega-trend ebook (FREE DOWNLOAD), high inflation is a deliberate and inevitable policy of the stealth default on UK public and private debt, this trend of high inflation is likely to persist for the whole decade because the government continues to print debt at the rate of £150 billion per year which remains on the SAME debt accumulation trajectory as the last Labour government. High UK Inflation that has apparently surprised everyone to the upside for virtually the whole of 2010, by spiking and remaining above 3% from early 2010 illustrates the tendency of the mainstream press to basically regurgitate the views of vested interests that have beaten the drum of always imminent DEFLATION for the whole of 2010 as High inflation was always just temporary and should be ignored by the general population. To look at the reason why high inflation has been ignored during 2010 we have to look beyond journalists, we have to look beyond academic economists that are paid to follow a school of thought that their pay masters want to push in the media. The place to look for the reason why high Inflation is being ignored is to the very top of the financial pyramid, to the Bank of England. The connection that the mainstream press has never been able to make is that the Bank of England does NOT make Forecasts. Instead the Bank of England quarterly inflation forecast reports are nothing more than ECONOMIC PROPAGANDA, that virtually always converge towards the Bank of England achieving its 2% Inflation target in 2 years time, despite the fact that historical analysis shows that the Bank of England FAILS in achieving its 2% target 97% of the time. The following are the last 7 quarterly Inflation forecast reports by the Bank of England issued from February 2010 to August 2011 that were instrumental in academic economists and journalists in the mainstream press regurgitating the always temporarily high inflation mantra during 2010 and into 2011, despite current CPI of 5.2%. UK Inflation by Feb 2010 had as I anticipated spiked to above 3% (27 Dec 2009 - UK CPI Inflation Forecast 2010, Imminent and Sustained Spike Above 3%). However the Bank of England's Feb 2010 Inflation Report forecast the spike as being temporary and to imminently resolve in severe disinflation to target a rate of below CPI 1% by December 2010, instead actual UK Inflation for December was 3.7%. The forecast for by the end 2011 was just 1.2%. The May 2010 Inflation report continued with the mantra of temporarily high inflation that would resolve in a rate of about 1.7% by the end of 2010, on the basis of spare capacity in the economy, the blatant flaw in the Bank of England's argument is the fact that much if not all of the spare capacity had been destroyed during the Great Recession of 2008-2009. The forecast for end 2011 was now revised to 1.3%. The mantra of spare capacity, downward pressure on wages to resolve in disinflation continued in the August 2010 Inflation Report. However now with most of 2010 gone, The CPI target for 2010 was revised higher to 3% from 1% (Feb 2010), with CPI for 2011 forecast to resolve to 1.2%, and a sub 2% CPI in 2 years time. The Bank of England's November 2010 Inflation Report (November 2010) forecast UK CPI Inflation to target an early 2011 peak of 3.5% before inflation falls to approx 1.7% by end of 2011, and for inflation to remain well below 2% into the end of 2012, therefore supporting the Bank of England's persistent view that everyone should focus on the Deflation threat and ignore high inflation during early 2011 so as the Bank of England can continue to keep interest rates well below the real rate of inflation for the purpose of funneling savers and tax payers cash onto the balance sheet of the bailed out banks. The Feb inflation report (Feb 2011) revised the for forecast for UK Inflation for end 2011 to approx 2.3% and yet again UK inflation in 2 years time would conveniently fall to below 2% and therefore the real threat remained DEFLATION. The May inflation report (May 2011) revised UK Inflation for end 2011 to approx 4%, compare that against a range of between 1.2% and 1.7% pumped out as deflation mantra during the whole of 2010. The most recent August 2011 Inflation Report now forecast a spike in CPI to end 2011 of 5.2%, which is set against the Bank of England's propaganda up until quite recently that it would fall to below 2%. That 5.2% spike has also been busted with today's inflation data of 5.2% set against the forecast of barely 2 months ago suggesting 4.5% for September. As ever the ongoing rise in inflation is ALWAYS deemed as being just TEMPORARY with UK inflation, you guessed it, to again as if by magic to converge to below 2% in 2 years time, and forecast to also target below 2% by the end of next year (2012). Be on your guard against propaganda that will suggest that UK inflation will imminently fall sharply from the Bank of England, mainstream press (BBC, broadsheets) and academic economists (media whores). These fools have been WRONG for 2 YEARS! Savers experience the stealth theft of wealth where even the best savings accounts paying 3% are still resulting in a loss of life time accumulated wealth to tune of at least 3.7% per year (RPI and after basic income tax). For savers to just break even they would need to be in receipt of a savings rate of at least 6.7%. Savers you have been fooled, fooled into believing that bailing out the banks was to protect your savings. Instead you have lost over 10% of the value of your savings since September 2008, your savings are effectively being stolen and funneled to the banks to gamble with without risk of loss as they know the tax payer will always step in to bail them out and savers will ultimately pick up the tab. For 50 pages of wealth protection strategies see the 100 page Inflation Mega-Trend ebook (FREE DOWNLOAD). I will also cover wealth protection strategies in depth in my next always free newsletter. I am intrigued to know how you go about calculating the real rate of inflation?